1998-09-04. New. Ships with Tracking Number! INTERNATIONAL WORLDWIDE Shipping available. Buy with confidence, excellent customer service! Carroll & Graf Pub, 1986-08-01. Paperback. Used:Good. 1986-08-01. Good. Ships with Tracking Number! INTERNATIONAL WORLDWIDE Shipping available. May not contain Access Codes or Supplements. May be ex-library. Shipping & Handling by region. Buy with confidence, excellent customer service! Collins, 1965. This is an ex-library book and may have the usual library/used-book markings inside.This book has hardback covers. In poor condition, suitable as a reading copy. Harper. Used - Good. 1952 Unknown Binding maps . 766 p. Former Library book. Bibliography: p. 725-728. Shows some signs of wear, and may have some markings on the inside. Harper. Used - Acceptable. 1952 Unknown Binding maps . 766 p. Former Library book. Bibliography: p. 725-728. Shows definite wear, and perhaps considerable marking on inside. Harper. Used - Good. Ships from Reno, NV. Former Library book. Shows some signs of wear, and may have some markings on the inside. 100% Money Back Guarantee. Shipped to over one million happy customers. Your purchase benefits world literacy! Konecky & Konecky. Hardcover. 1568525257 New Condition. . New. Konecky & Konecky, 2005-06-01. Hardcover. Used:Good. New York: Harper and Brothers Publishers, 1952. 6/13/2011. Near Fine/Very Good. Reprint. Octavo. 766pp. Discoloration to very bottom of spine, else near fine in a very good dustwrapper with a small tear at the top of the front wrapper and chipping to the spinal extremities. 2005-07-06. Good. Ships with Tracking Number! INTERNATIONAL WORLDWIDE Shipping available. May not contain Access Codes or Supplements. May be ex-library. Shipping & Handling by region. Buy with confidence, excellent customer service! London: Collins. Very Good. 1952. Hardcover. London: Collins, (1952). Second impression. 766 pages, hardbound. VG in blue cloth, no DJ. .
Harper, 1952., 1952. 766p. Maps. Excellent early operational study NW Europe D-Day to VE Day, from English viewpoint. Blue cloth. Near Fine copy. Hardcover. Near Fine. London: Collins, 1952., 1952. (1952 2nd ed.) 766p. Maps. excellent early study D-Day to VE Day, from English viewpoint. Blue cloth. Paper toned. Very Good Copy. Hardcover. Very Good. Harper, 1952., 1952. 766p. Maps. D-Day to VE Day in western Europe. Excellent early operational survey. Near Fine/Very Good Copy. Hardcover. Near Fine/Very Good. London: Collins, 1952. First Edition. fair. 766, maps, endpaper maps, footnotes, appendices, index, foxing ins bds & flylves & to fore-edge, bds & spine scuffed & scratched. Place_Pub: New York: Harper & Brothers, 1952. fair to good. 22 cm, 766, maps, endpaper maps, footnotes, appendices, index, some darkening to text, boards worn & scuffed, spine lettering faded. Front board cloth creased, edges stained. Harper, 1952., 1952. 766p. Maps. Excellent early operational study D-Day to VE Day, from English viewpoint. Blue Cloth. Spine rubbed. Very Good Copy. Hardcover. Very Good. Konecky & Konecky. Used - Good. Ships from the UK. Former Library book. Shows some signs of wear, and may have some markings on the inside. 100% Money Back Guarantee. Your purchase also supports literacy charities. Collins. Used - Good. Ships from the UK. Shows some signs of wear, and may have some markings on the inside. 100% Money Back Guarantee. Your purchase also supports literacy charities. Collins. Used - Acceptable. Ships from the UK. Former Library book. Shows definite wear, and perhaps considerable marking on inside. 100% Money Back Guarantee. Your purchase also supports literacy charities. Collins. Used - Acceptable. Ships from the UK. Shows definite wear, and perhaps considerable marking on inside. 100% Money Back Guarantee. Your purchase also supports literacy charities. Konecky & Konecky, 2005., 2005. Royal octavo, hardcover, fine in near fine black and brown pictorial dj. 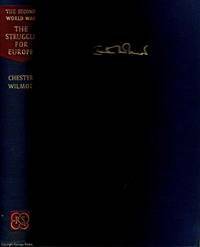 This most highly regarded single-volume history of the Second World War in Europe was first published in 1952. It has the advantage of the author's extensive interviews with participants from all sides of the conflict, when recollections of the war were still painfully fresh. 766 pp. including index.. Hardcover. Fine/Near Fine. NY: Harper & Brothers. Good with no dust jacket. 1952. Hardcover. No DJ Spine and edges have moderate wear. .
New York: Harper & Brothers, 1952. Book. Fine. Hardcover. Fine cloth hardcover with no dust jacket. Aged papers, very light soiling on cover, sunned spine, signature in pen on title page, otherwise a very nice clean snugly bound copy..
Harper, 1952., 1952. 766p. Maps. Excellent early operational study of the campaign in NW Europe D-Day to VE Day, from English viewpoint. Blue cloth. Spine lettering rubbed. Very Good Copy. Hardback. Very Good. Book. Harper, 1952., 1952. 766p. Maps. Excellent early operational study D-Day to VE Day, from English viewpoint. Cocked. Good/Good Copy. Hardcover. Good/Good. London: The Reprint Society, 1954. Cover is bumped, scuffed, and has edgwear. Pages are clean and tight. Book has weak hinges.. Hard Cover. Good/No Jacket. 8vo. New York: Harper & Brothers, 1952. fair to good, ex-lib.. 22 cm, 766, maps, endpaper maps, footnotes, appendices, index, usual library markings, waviness to a few pages, small spine tears. Some scuffing and edge wear to boards, newspaper article from the Manchester Guardian Weekly in pocket at end of volume (facing page darkened). Condition: fair to good, ex-lib. The Reprint Society, London, 1954. Third Edition. Hardcover. Very Good Condition/No Dust Jacket. Size: Octavo (standard book size). 848 pp. Text is free of previous owner's markings. Front board is detached but rest of binding is tight. No foxing in this copy. Edges greyed with dust marks. General shelfwear to covers edges and corners and first few pages detatched with front board. Quantity Available: 1. Shipped Weight: Under 1 kilo. Category: Military & Warfare; Europe; 1940s; #85725; History. Pictures of this item not already displayed here available upon request. Inventory No: 45635. .
London: Reprint Society. 1954. Cl bds, no d.j., maps in text, owner's inscription on half-title page, frontis portrait loose, 848 pp., edges of spine rubbed, some wear to boards, o/w good. 848 History of the Second World War. 2nd Edition. Hardbound.